Datura stramonium, jimson weed, angel’s trumpet, devil’s cucumber, devil’s weed, thorn apple, tolguacha, Jamestown weed, stinkweed, moonflower, malpitte, mad seeds—whatever you call it, this member of the nightshade family is part of the bokor’s bag of tricks and one of the ingredients in zombie powders. It contains atropine, hyoscyamine and scopolamine, chemicals that can cause hallucination, memory loss, paralysis and death. The thing is, this plant is a wide-ranging annual herb, a tall, bushy weed that grows wild all over the world (by the side of the road, in dumps) and has a history of causing trouble. You’ve probably seen the beautiful bell-shaped white flowers or maybe even the oval, often spiny seed pods filled with tiny black seeds. The nightshades (solanaceae) are quite a family of plants. 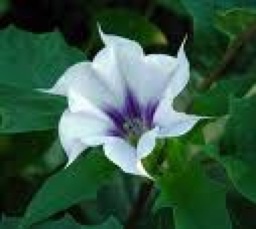 In addition to datura and mandrakes, this group includes belladonna or deadly nightshade, paprika, chili pepper, potatoes, tomatoes, eggplant, tobacco and petunias. But datura is the zombie powder ingredient. There’s an elegant specimen leaning over a garden fence in my neighborhood. It’s that common, but quite dangerous in the right— or wrong—hands. Many thanks. I didn't realize datura stramonium was also the famous Moonflower, a garden delight. In the field, it was famous for harming livestock. I'd be interested to know how goats and hogs react to it.